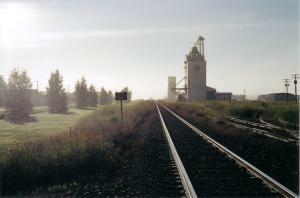 Looking east through the early morning mist: These two grain elevators in Aberdeen are still in operation. In the foreground stands Cargill's elevator built in 1981; behind it is the Saskatchewan Wheat Pool elevator that dates to 1954 (renovated in 1989). Photograph taken on August 10, 2004. Town, pop 534, located approximately 32 km NE of Saskatoon off Hwy 41. The first settlers—people of Russian, English, Scottish, and Ukrainian descent—arrived in the late 1890s. The CNR arrived in 1905, and by the 1930s the population was close to 300. While Aberdeen’s proximity to the city of Saskatoon contributed to the town’s decline for several decades, it has more recently contributed to renewed growth beginning in the 1970s. Many residents of Aberdeen now commute to work in Saskatoon, and local employment opportunities are found in agriculture-based industries and small business. Aberdeen Composite School has a staff of 38 and provides K–12 Education to close to 400 students from the town and surrounding district. In 2003, the community received a major boost with the announcement that a multi-million dollar cultural and recreational complex would be built.